HUMBAHASTIMES -- The Indonesian government wants to export more locally manufactured weapons in an effort to boost the defense industry in the country. In its latest measure, the government has explored the possibility of exporting bombs produced by a manufacturer in Malang, East Java, for Sukhoi jet fighters. “If their products cannot be fully used domestically, they should export them. The problem is, exporting weapons is not purely a commercial matter. There are non-trade issues we must also settle,” said Coordinating Economic Minister Darmin Nasution during a visit to weapons manufacturer PT Sari Bahari‘s factory in Malang on Thursday. Communications and Information Minister Rudiantara, Public Works and People’s Housing Minister Basoeki Hadimoeljono and East Java Governor Soekarwo were also present. During the visit, Darmin explored Sari Bahari’s business situation, including its production capacity. With another weapons manufacturer, PT Dahana, PT Sari Bahari is now producing various primary defense systems (alutsista). They include the P-100 and P-250 bombs, which are for practice and to carry live warheads, the P-500 live bomb, 70 and 80 mm warheads for both smoke bombs and real explosives, the Petir missile target drone and the Rocketpod 7 tube launcher. 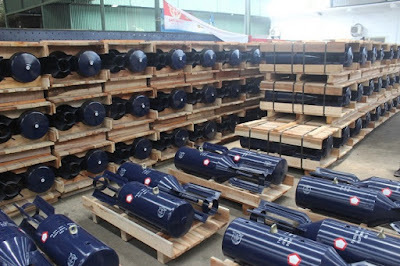 Sari Bahari president director Ricky Hendrik Egam said several parties were interested in buying the bombs produced by the company. “They have conveyed their interest in buying bombs [for Sukhoi jet fighters],” said Ricky. He said Sari Bahari once exported hundreds of 70 mm smoke warheads to the Chilean Air Force. Currently, Sari Bahari is focusing on producing up to 100 bombs per day to fulfil the needs of the Indonesian Air Force’s military exercises. Every year, Indonesian pilots conduct bombing exercises using thousands of P-100 bombs produced by Sari Bahari.